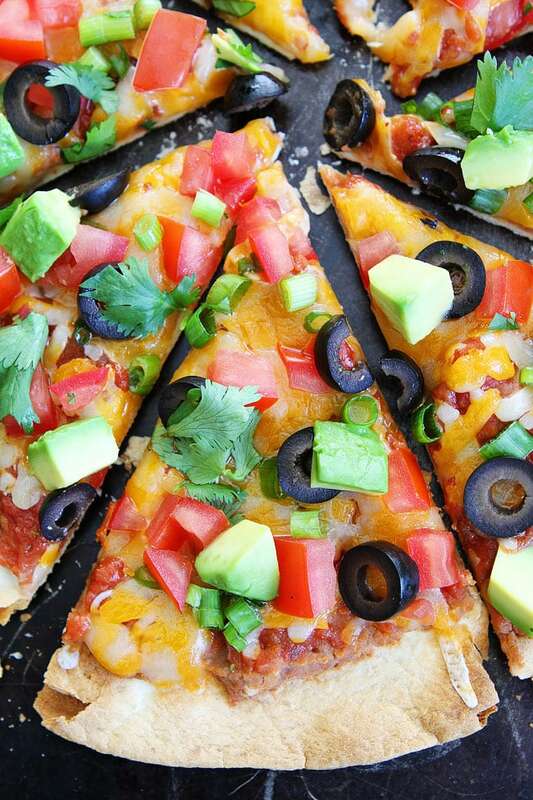 Crispy Mexican Tortilla Pizza – this easy tortilla pizza only takes 15 minutes to make! 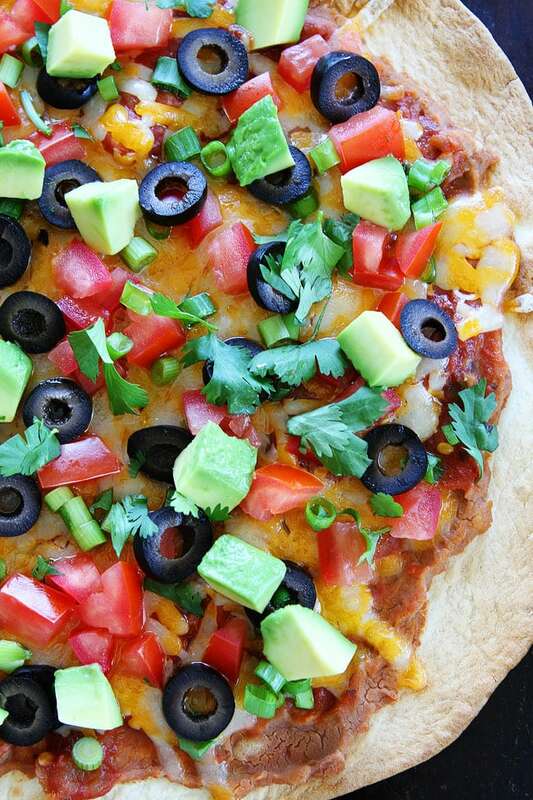 Topped with good-for-you ingredients, Mexican pizza is an easy family favorite! 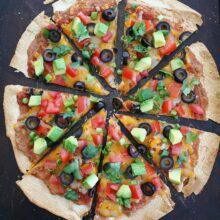 My boys love pizza and Mexican food so it isn’t a surprise that one of their favorite meals is this Crispy Tortilla Mexican Pizza. 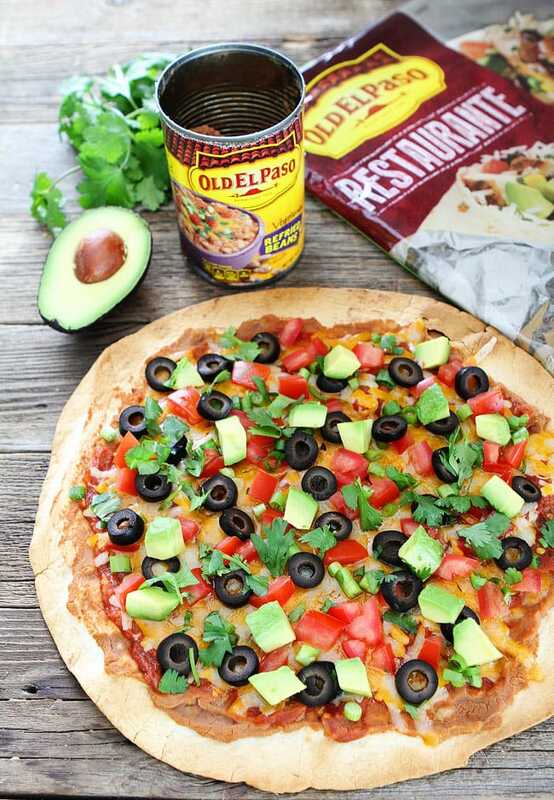 They probably eat this Mexican pizza once a week and I am ok with that because it is super easy to make and topped with good-for-you ingredients! And when I say easy, I mean 15 minutes easy…you can’t beat that! The crust of the tortilla pizza is, you guessed it, a flour tortilla! You don’t have to roll out any pizza dough for this Mexican pizza. See, I told you it was easy! We like to use Old El Paso’s Restaurant Grande Flour Tortillas because they are huge and great for making this Mexican pizza. You can make smaller Mexican tortilla pizzas by using regular flour tortillas. Both work great! We crisp up the tortillas in the oven and then top them with Old El Paso’s Vegetarian Refried Beans, salsa, and shredded cheese. They go back in the oven for a hot minute, just until the cheese is melted, and then we top them with all of our favorite toppings. 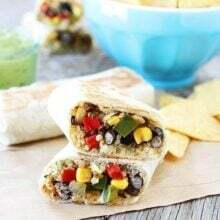 We like to add tomatoes, black olives, avocado, cilantro, and green onion. Feel free to add your favorite Mexican toppings! 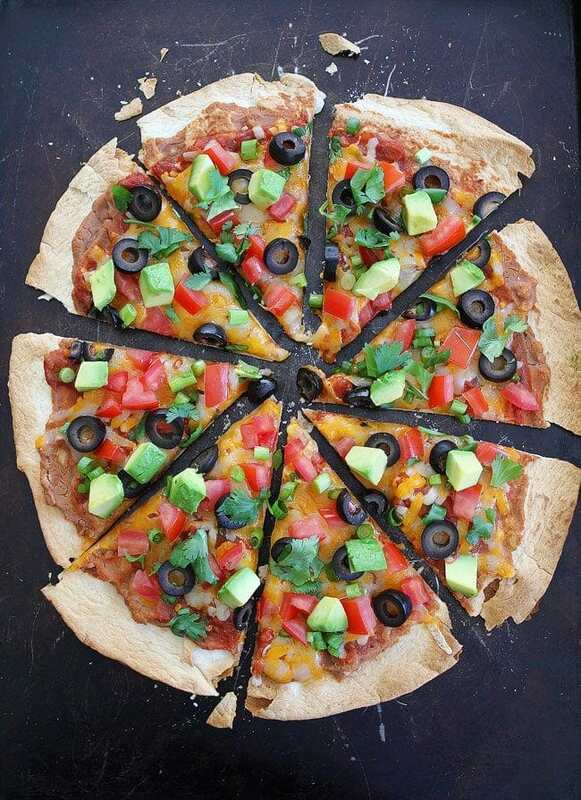 Cut the tortilla pizza into slices and serve immediately! The pizza is crispy and delicious! 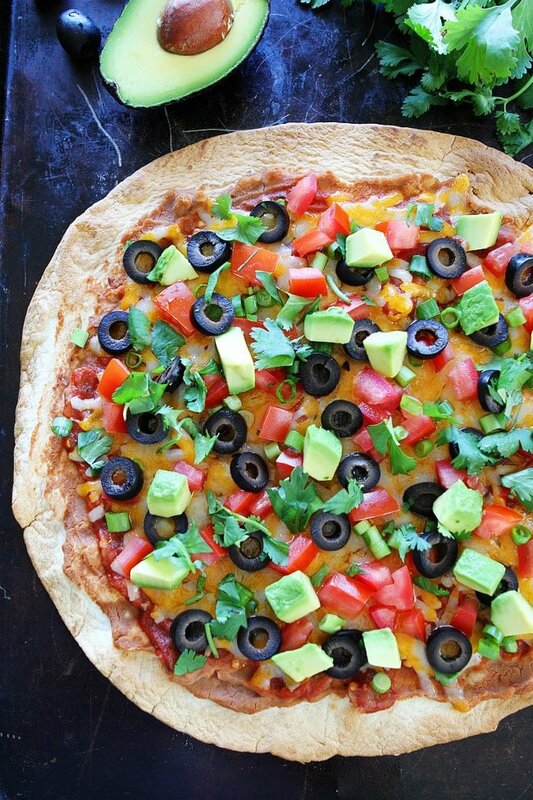 Make Crispy Mexican Tortilla Pizza for dinner tonight! 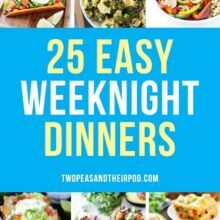 Everyone needs a 15-minute meal in their back pocket! This easy tortilla pizza only takes 15 minutes to make! Kids and adults love it! Preheat oven to 400 degrees F. Place tortillas on a large baking sheet. Poke the tortillas with a fork, this will prevent them from puffing up in the oven. Bake tortillas for 3-4 minutes or until slightly golden brown. Remove from oven. Evenly spread tortillas with refried beans. Next, evenly spread on the salsa and top with shredded cheese. Bake for 4-5 minutes or until cheese is melted and edges are golden and crisp. Transfer the tortillas to a cutting board and let cool for 1 minute. Top with avocado, tomatoes, green onion, black olives, and cilantro. Cut into slices and serve immediately. This post is sponsored by Old El Paso, but our opinions are our own. Thank you for supporting the brands that continue to make Two Peas and Their Pod possible. Such a great idea! 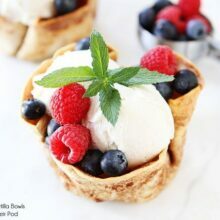 I feel like my kids would just scarf these down! hey Maria This looks amazing! Yummy! The 15-minute crispy mexican tortilla pizzas can save you quiet some time in the morning hurry. Its so colorful. Its definitely going to be in my kid’s favorite list. I want a slice of this heavenly spiciness! This looks good except I don’t like refried beans. I wish this was something else I could substitute . Karen, you could use mild enchilada sauce, or pizza sauce, or spaghetti sauce. If you use pizza or spaghetti sauce it’s not really Mexican pizza anymore, just regular pizza, but still delicious! Oh how I love pictures of such gorgeous avocado, instead of black spotted ones, lol. I’m definitely making this for dinner…great idea! Thanks! Love how massive those tortillas are for making pizzas! Two of our family favorites combined together to make a great family treat our girls will love. Thanks for this recipe !! It was about to be a depressing Saturday night (first week trying to eat healthier) util we found this : ) So full of flavour and super easy. Straight to my bookmarks ! I’ll keep on looking around your site ! This was delish! Such a fun twist on our traditional quesadilla that we make all the time, great way to change it up! Okay. Can you explain to me why you two extra tortillas? Do you place them on top of the large one? One or the other. If you can’t find the big tortillas, you can make two smaller pizzas:) I hope that helps!